Our tours aim to provide adventure and fun, and at the same time give you the opportunity to see wildlife as it was meant to be, in its natural environment. Our guides can provide you with information about the native flora and fauna, and hope to inspire you to help conserve the island for future generations. 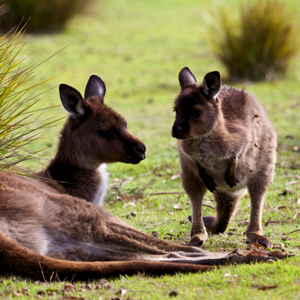 Protected by the surrounding water, Kangaroo Island is a haven for wildlife. Isolated from the mainland, the impact of settlement has been reduced and the island has retained close to half of its native vegetation. Without the threats posed by rabbits and foxes on the mainland, the native flora and fauna has thrived making the island a true wildlife sanctuary. Native wildlife that can be seen on our tours includes the Kangaroo Island Kangaroo, Rosenberg’s Sand Goanna, the Tammar Wallaby and the Short-beaked Echidna. With the isolation of Kangaroo Island, these animals have evolved to be distince sub-species of the wildlife found on the mainland. 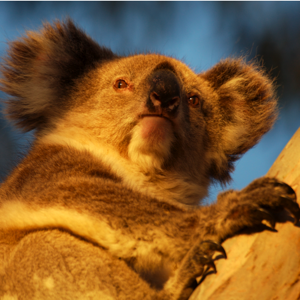 Although not native to Kangaroo Island, the Koala, can often be spotted on tour and is always a highlight. 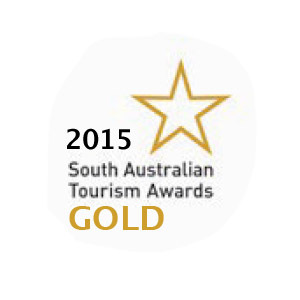 During your visit to Kangaroo Island, you’ll be sure to see the New Zealand Fur Seal, Penguins and Possums. Kangaroo Island has also been identified as an Important Bird Area because of the populations of vulnerable birds found there including the Glossy Black Cockatoo, Hooded Plover, Western Whipbird and others. A sub-species of the Western Grey Kangaroo, the Kangaroo Island Kangaroo is smaller and darker than the mainland species. They can be found in woodlands, open forests, coastal heathland, and open grassland areas. Most often seen at dawn and dusk when they graze. They live in small family groups, with males competing for dominance. A dominant male resides with the mob when females are fertile but separates from the mob in winter. Although they are common, the Western Grey Kangaroo is a protected species. This attractive and unique animal is a marsupial, or pouch carrying mammal, like the Kangaroo. Introduced to Kangaroo Island in the 1920’s, they thrive in controlled conditions where predators and competition is absent. Mainly nocturnal and completely arboreal, they come to the ground occasionally to move to another tree. Extremely slow-moving, they are relatively defenseless. Koalas are herbivours, with a highly specialised diet in which they eat only 20 of the over 700 species of eucalyptus, and prefer only five. Koalas in South Australia were largely exterminated during the early part of the 20th century as they were hunted for their fur, and because their environments were destroyed by fires caused by humans. They are now legally protected with their main threat habitat destruction. Management can be difficult as populations that are protected such as on Kangaroo Island reach such high numbers that they can destroy the trees on which they feed. Together with the platypus, echidnas are the world’s only monotremes, or egg-laying mammals. The echidna is a shy animal and would rather retreat than fight if disturbed. When frightened it will curl into a ball, with its snout and legs tucked beneath it and its sharp spines sticking out. Mot of the year echidnas are solitary animals, except in breeding season when they form echidna trains – males follow a female in single file, nose to tail. Termites are the preferred food. 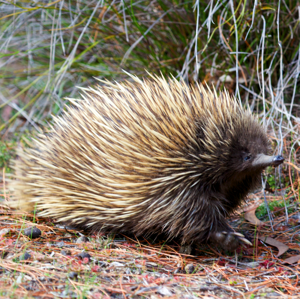 Although no population estimate exists, the echidna is not listed under the Environment Protection and Biodiversity Act. The Tammar Wallaby has smaller and finer features than the Kangaroo. It is abundant on Kangaroo Island, but mainland populations are extinct in southeastern Australia, with only a small population in Western Australia. They are solitary but aggregate on pasture at night. During the day they rest in low scrub, and although they begin to move at dusk, they do not leave the scrub until after dark. They eat native grasses and can drink seawater to survive drought conditions. It has embryonic diapause and can control it’s breeding when food and water are scarce. 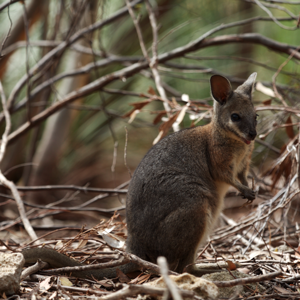 The Mainland South Australian Tammar Wallaby is currently listed as ‘extinct in the wild’. This subspecies was driven to extinction on the mainland in the 1920’s due to land clearing and predation by cats and foxes. Unable to control their own body temperature, they need to bask in the sun for at least half an hour each day before becoming active. The Rosenberg Goanna’s skin is a darker colour than other goannas, so they can absorb and regain solar energy more readily. 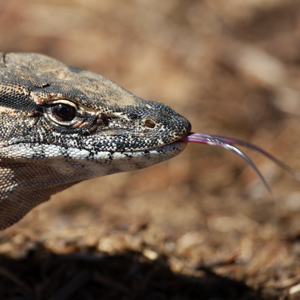 The Heath Goanna is powerfully built and can grow to 1.5 metres long. Living in a variety of habitats, it shelters in burrows, hollow logs and rock crevices. The menu of the Heath Goanna consists of spiders, scorpions, and other large insects, as well as frogs, snakes, lizards, small birds and mammals. There is little interaction between individual goanas except during the breeding season. It is listed as vulnerable in Victoria. Significantly prone to future threats that are likely to result in extinction; and are very rare in terms of abundance or distribution. 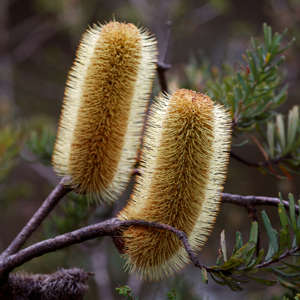 891 species of native plants and 46 endemic species are found only on Kangaroo Island. The island’s plant catalogue lists 891 species, as well as approximately 250 that have been introduced from other parts of the world. There are wildflowers to be found in every season, and September and October reveal spectacular flowering of much of the flora.